A very good life drawing class last week. Learning about anatomy and how to represent it in our work. We were lucky to have two models for the evening. For the short poses, they alternated, and then for the long poses, we were drawing them together - quite challenging given the time we had. It's hard enough to draw one person in 20 minutes, but drawing two!! We were to focus mostly on the torso area, as this is where the big bones and muscles are really interesting, and sometimes visible. Doodling at home. A good way to fill in blanks in the day without investing too much time! Our growing gherkin plant. I might try to add a dash of water to this sketch and see how it behaves on the Firmo Diário Gráfico paper. Once I get into a groove, it's hard to stop me. I think the word 'prolific' applies here. I was chatting to a little girl all while sketching this. She was really interested in what I was doing. Her favourite colours are blue and pink and she likes drawing. Children often are fascinated when they see us sketching - the idea that grown-ups can draw for fun too must seem strange to them. Me, I'm just hoping to inspire the next generation. And I'm quite chatty. The pram in the foreground was black but I made it red. Much prettier. As the weather got drier, I decided to go outdoors again and sketch a grand-father playing football with his grand-children. They were enjoying themselves. I sketched the apartments in the background with as little detail as I could, to try and give a sense of the distance. For this, I used my mini Sennelier watercolour set - tiny but perfectly formed. Another sketch done outside, again with brush pen first, then Sennelier watercolour. And then it was time for a slice of dark chocolate and aubergine brownie ("just 3 euros" he said!) and a chat with my fellow sketchers. Two sketches done in Herbert Park with Dublin Sketchers. The weather wasn't great - a steady mizzle, and the seats under the umbrellas were occupied by families. A few of us sat outside against the wall for a bit - there was a good overhang giving us shelter. Until the rain turned and started coming at us. Thankfully, I was using my little Firmo Diário Gráfico and I could hold it nearly vertically and draw at the same time with a Pentel brush pen, which uses waterproof ink. What I discovered is that this paper and pen are made for each other. The paper is 160g, so it's not very thick (you can see through the pages a little), but it's got a smoothness to it that works perfectly with the brush pen. I know that if I don't want sketches to show through the pages, I could just draw on one side, but I'm used to a much bigger panorama sketchbook, so it's going to take me a little while to become comfortable with the format. But I think I'm going to use my brush pens a lot more now! I was planning to leave this sketch in pen only, but it was a little dull, so I added a dash of colour - I mixed green apatite genuine and cobalt teal blue (PG50), and the granulation looks really nice on the page. I don't think this thickness of paper will be able to handle wet washes, but I'm happy with how the pigments settled on the page all the same. When in Porto, I got a Firmo Diário Gráfico, a nice medium-sized sketchbook. With it came a competition - if you were the first person to do a sketch in your city, you could become an ambassador for the brand. Me, I can't resist a competition! So I posted my sketches from the Olivier Cornet Gallery on Facebook and Instagram. A couple of days ago, I heard back from Firmo, telling me I was the new brand ambassadress for Dublin!! So excited. They asked me if I could send them a sketch from Dublin that they could use with the announcement. So I headed into town on Saturday morning to set to work. Nothing like a deadline to focus the mind!! I tried to apply what I learned at Liz Steel's workshop in Porto - some of my windows are wobbly, but I did work structurally! When I got home, I added a bit of colour. I think I prefer the version before colour. Thankfully I had taken a photo before picking up my paintbrush! I've sent them both versions - let them decide! The announcement is due to take place on 24th of August, to coincide with Artists' Day in Portugal. I chatted to so many people while sketching this view! A nice gentleman told me that the renovated castle (now to let) I was sketching was connected with the poet WB Yeats, and that when the current owners bought it, they found dry rot everywhere, and had to spend quite a bit of money making it habitable again. He also told me that the little blue house (the one on the left in my sketch) was sold a while back but it looked like it was a house that would need a bit of work. He also said that the yellow house to the left of that (just a bit of wall at the very left of my sketch) used to be a hotel and it was for sale. Many people, old and young, stopped on their way to see what I was doing. I'm always glad to have a chat and show my work. Most people saw it when it was still just a pencil sketch. I did some basic measuring, working structurally from left to right, and checking my angles often. I omitted the new trees planted in front of the door of the castle, as I felt they were obstructing the view too much. I was lucky that the cars parked in front moved, and I was able to see the base of the wall. Plus I'm really bad at drawing cars, so it would have ruined my sketch! This was the last page of one of my sketchbooks, so I wanted to do something a bit different from my usual loose and colourful style. The very first sketch in this book is the cherry blossoms, back in May. Maybe I just wanted to prove that I can draw architecture? The teacher thought I was mad to attempt watercolour. But you know me, I have nothing to prove, and no fear of failure! I forgot to write how long these poses were - 10-15 minutes each. And I swapped to my sketchbook between the first and the second, as I had to wait for paint to dry before tearing the page from the block. I think the second one was 10 minutes twice, with a break in between, hence the more finished look of it, plus I actually did a drawing to start with! The first one is direct watercolour - I should have painted little guideline dots for the feet and the head, so as not to run out of space!! That's one thing to remember. And also to bring cold-pressed paper rather than rough - too much texture made it extra hard to capture the figure. I added a background to my favourite one when I got home (well, the following evening). Before finishing the session, the model put on a diaphanous dress - I did this one in my sketchbook. Have a look at everybody's work on the Dublin Drawing page! After lots and lots of 1-minute and 5-minute drawings that seemed to go in a flash - I was still struggling with understanding this model's shapes-, we moved to the longer poses. My plan all along had been to go to watercolour. I had brought a watercolour block with me and minimum supplies. But there wasn't going to be a long pose tonight, instead, a series of 10-minutes and 15-minutes. So I had to alternate between watercolour and pen in order to give my paints enough time to dry before going to the next page in my watercolour block. I was glad I had brought my A4 sketchbook and my Sailor Fude pen (with a gorgeous grey waterproof ink, a Rohrer & Klingner sketchINK, in a colour called Thea, which I bought in Porto). Not all drawings were successful. At times, I felt I had bitten more than I could chew. I even got so frustrated with one of my attempts that I started sketching the people in the background, to make the drawing more urban sketchy. Not very successfully. It all felt a bit overwhelming. But I stuck to it. This morning, I decided to add shading to the background, using the same ink, slightly diluted and applied with a brush. Somehow, it seemed to bring everything together. As a double-page spread, I'd even venture as far as calling it a success! Never too self-critical. That's me! I have a tendency to jump right into things, so after one class only at Block T, I went to the untaught session. Yes, my work wasn't of the same high standard as some of the others. But still, I got completely immersed, with little panic attacks here and there, and, most importantly, I survived it. The model even took photos of my watercolour work, which I was thrilled about. If she was happy with how I represented her body, that was good enough for me, then! The 1-minute drawings were fine. But 5- and 10-minutes were so hard. I felt I should have more time to measure and correct, but it always seemed to be a mad rush! Clearly spending too much time on the initial impression, and not allowing myself enough time to get things right. You will see in the 5-and-10-mins drawings that I had to correct the size of the head - it's because the method I've learned is to take a measurement of the head and then see how many heads fit the whole way down to the toes. I always find that the body is too long compared to the head. Rather than redrawing the whole body, I redraw the head. Makes sense to me, anyway! The photos are in reverse order. Having just watched a YouTube watercolour demonstration by Uma Kelkar, I feel I have so much to learn still, but the only way to learn is by painting - I can read all about composition, hard and soft edges, tea, milk, honey, keeping whites and all these wonderful things. But the important thing for me is to put paint to paper and see if I can remember and apply the techniques I've learnt over the years, through books, videos and a few workshops. Sometimes it all comes together. Sometimes you're the bug. This is a really old video, but Uma Kelkar is an artist that I really admire, so I thought I'd share this from YouTube! I love how she paints. Next Urban Sketchers Symposium, I must go to her workshop! I really want to paint loosely like she does! PS: I'm also the lucky (or persistent?) person who won the bidding war for her painting at the Porto Urban Sketchers Symposium. The painting is currently at the framers and I can't wait to have it back home! Another version of the same view, this time in direct watercolour, and using just three colours - quinacridone gold, quinacridone rose (PV19) and phthalo turquoise and Green Apatite Genuine. Why use two greens? Well, I wanted a bright green for the grassy area -that's the green apatite and the quin gold. But also a really dark green for the trees in the distance - and a friend reminded me recently that phthalos make gorgeous darks - that's the phthalo turquoise and the PV19! Strange, this obsession of mine with painting Belfield. It's my husband's alma mater. But, until we got a dog five years ago, I didn't particularly like going there for walks. Given a choice, I'd always pick Killiney beach instead. I felt Belfield was too closed in, with no views into the distance. It was just convenient, a short drive from home. Then, we got a dog, and I discovered sections that I had never set foot in before. With open playing fields, big skies and a tiny bit of the mountains in the distance (conveniently ignored in this painting). And also, if our dog is happy, we're happy. Another view of Belfield - one of the places where I can watch and photograph big skies without having to go too far. Next time I paint this view, I want to go wilder - maybe more of a close-up, but still with plenty of sky. It's always about the sky for me. Next symposium, I must attend Paul Wang's workshop. I'm trying to paint windows using wax crayons to reserve the whites, but I'm not sure I'm on the right track! I must try a few more, with different paper, and a lighter pencil line. Before things get busy again, we decided to go and visit friends. I was glad I did these two sketches in Donegal - a watercolour of the bay looking down towards Sligo, and a pen sketch of the main street, as seen from the house, which dominates the town. These two views are part of the same vista, but I would have needed an accordion sketchbook, and a lot more time, to tackle the whole view. I'm quite prolific these days, making the most of the good weather we've had. But I'm so far behind in posting online that this blog is quite out-of-sync with my life! Never mind! So this is a post about the sun shining in Dublin and people enjoying the good weather in St Stephen's Green. As I'm writing this, the sky has turned really grey and it might even be raining! Anyways, still trying to put into practise what I learned in Porto - trying to draw people-focussed vignettes. The location for Dublin Sketchers that Sunday was the Royal Hibernian Academy. But the sun was shining. I knew it wasn't going to last - by August, an Irish summer is pretty much over. So I headed to the park instead. First, I sat on the grass in the shade at the main nexus - it has fountains, flower beds, and lots and lots of tourists. What caught my eye was all the people taking photos, so I tried to sketch the verb "take a photo" and related activities. The two guys on the left are not tussling for the camera - they're both looking at the camera screen to admire one of the shots just taken by the guy on the right. I need to improve on that, but you can see that they are both looking at the same thing, so that's a start. I'm particularly happy with the guy on the right. I kept him very abstract, but his posture looks quite convincing (in my not-so-humble opinion). I added the supporting landscape afterwards, moving flower beds and trees as needed to put together my story. When I was finished, I chatted to a young woman from Kerala, she's studying literature in Ireland, and she had watched me sketch. We chatted about A Suitable Boy and Sense and Sensibility. And then I moved to my next spot. There was a man doing yoga stretches. I used my Marabu pens (the fancy one from Porto and the cheap one from Lidl - they behaved the same!). But I think he noticed me and he soon moved on. I turned 90 degrees, and I had my next scene right in front of me. Three Spanish girls were chatting away int the shade of a tree. They were deeply absorbed in their conversation and never noticed me. So that was me done for the afternoon. Time to catch up with the others and their sketches. Maybe that was the last beautiful day of the summer. I'm glad I spent it sketching! Of course, what I should have realised at the time is that I was trying to sketch the person, not the verb! Next time, I need to place a little post-it in front of me to remind me! In the end, I gave up trying to draw the hand - I just tried to give an idea of the general posture, the head bent down, the right shoulder up. We're not gardeners. I used to grow flowers in pots and they did well, but 10 years ago, we changed our back garden to a decking, and we wanted to keep it sleek and modern. So all the pots were got rid of. In the last few years, a friend tried to make gardeners of us, giving us tools, plants, but nothing worked. We were just not into it. But this summer was different. We got the free little seed pots that Lidl were giving away when you spent €40 or more. They were so cute I couldn't resist! Some didn't work out (lamb's lettuce, rocket). But with the wonderful summer we had, a few things thrived, like the mixed lettuce and the parsley. 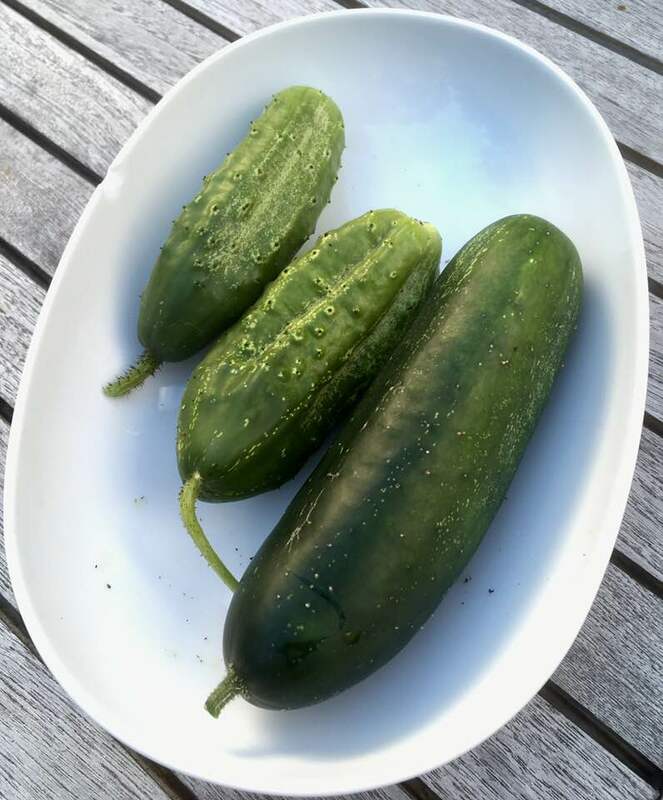 What gave us joy in particular were the cucumbers and gherkins - it was wonderful to see them grow, spread their leaves, extend their tendrils, offer their flowers to the bees (bumble bees mostly) and then to see the fruit expanding day by day! It wasn't a huge crop - you can't really talk of a harvest, but it was exciting all the same. So far, one good cucumber, four gherkins, with a few more potentials, if only the weather can brighten up again. It's been so much fun. We'll have to try again next year! our own mixed lettuce, parsley and cucumber! 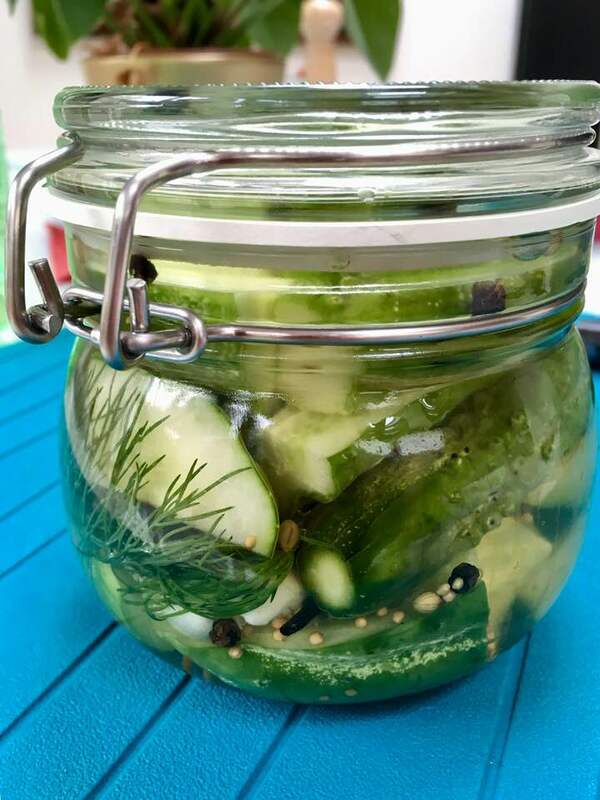 Pickling gherkins was a lot easier than we thought (well, I just watched!). We'll know in a week or so if they are good. We tasted them before pickling and they were very tasty already. A lot of effort just for one jar? It was all worth it! I went back again to Craftsy to copy some of Suhita Shirodkar's sketches - hoping that by copying how she sketches, it will some day come naturally to me when I'm out in the real world trying to capture a gesture, a movement, a fleeting moment! Isn't it what art students did in the old days - copy from the masters! They probably practised a lot more than I do. In our wonderful goodies bag at the Urban Sketchers Symposium in Porto was a gorgeous Marabu Aquapen Graphix - everyone got a different colour. It's got a brush pen on one side and a fineliner on the other. Both are watersoluble. Fabulous for catching a movement or a face. Somehow, it looked familiar. By chance, I realised why. Months ago, I bought a cheap box of watercolour pens in Lidl. They are called Marabu Watercolour Pen, but otherwise, it's identical. Yes, the pale pink and the pale blue pretty much disappear when you add water, but the other colours will be useful for practising people in motion. So glad I was looking for something else in that drawer! Dalkey Quarry 2, and then I do thumbnails!